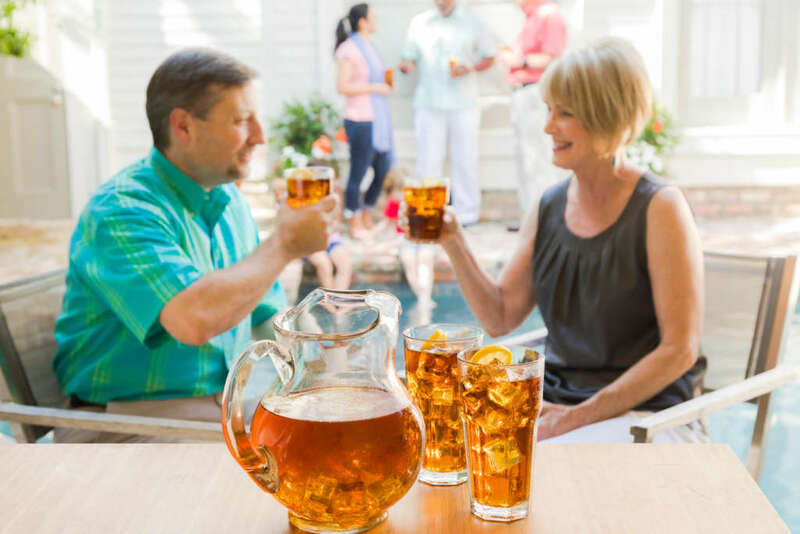 Few things are more beloved in the South than Sweet Tea, and while some you of were probably born knowing how to make it from scratch, we’ve learned a few inside tips and tricks in our 100+ years in the tea business that might make your next pitcher of Sweet Tea the best ever. Here’s our family-tested, time-honored method for making a gallon pitcher of Sweet Tea from scratch. You’ll see that we brew up a concentrate* first, using half the water, and mix in the remaining water later. You’ll need a big cooking pot, a big stirring spoon, and an extra-large pitcher with a top to keep your Sweet Tea fresh in the fridge. Add tea bags and allow to steep for 3-5 minutes depending on the strength of tea you prefer. Remove tea bags and stir sugar into warm tea; continue to stir until completely dissolved. Pour concentrated tea into pitcher and mix in remaining 8 cups water. Pour into glasses packed with ice cubes, garnish and serve. For best flavor, refrigerate and use within 48 hours. This is the best way to make classic, traditional Sweet Tea from scratch, but goodness knows we enjoy our variations, too – starting with Luzianne® convenience products like our pre-sweetened Luzianne® Iced Sweet Tea Bags and Luzianne® Sweet Tea Single Serve Cups, as well as other tea types, like Luzianne® Iced Green Tea and Luzianne® Hibiscus Iced Tea. You can also add lemon or orange zest, lemon juice, or lemonade to the warm tea concentrate – or spike it with fruit juices or purees and bourbon, tequila or vodka to make a refreshing party punch. *This Sweet Tea concentrate is great for making all kinds of tea-based drinks and cocktails. To make a Bourbon Sweet Tea Cocktail, combine 1 oz of your sweet tea concentrate, 1 oz of bourbon or similar whiskey, 4 muddled (slightly crushed) mint leaves and 1 squeeze of lemon. Pour over crushed ice and top off with 1 oz sparkling water.